This week (for possibly the first time ever) I’m joining in on The Broke and the Bookish’s Top Ten Tuesday! What’s Top Ten Tuesday, I hear you ask? A Dog Called Kitty – Bill Wallace – I’ll be honest, I don’t remember a whole lot about this one other than the fact I bought it at a Scholastic Book Fair (remember those?) and it’s about a dog and it made me cry. That’s it. Probably worth going back to reread. The Diary of a Young Girl – Anne Frank – I loved this book and I read it quite frequently growing up. I haven’t read it in a few years but it’s one of those I know I’ll eventually get around to reading again for the hundredth time. Bridge to Terabithia – Katherine Paterson – Another one that made me cry as a kid (we read it in class). So tragic! Never have seen the movie, and I’m ok with that. Flight #116 is Down – Caroline B Cooney – I totally attribute this book as being one of the main reasons I’m scared of flying. A teenage girl takes charge when a passenger plane crashes on her family’s property. I remember it being fairly grisly and graphic. Flowers for Algernon – Daniel Keyes – I was actually talking to N about this one not too long ago. The first time I came across this book was in a sampler that we read (I think) in 7th grade. It wasn’t the full book, just selected bits from the beginning, middle and end. I only read the full book for the first time a few years ago. Absolutely haunting. Harriet the Spy – Louise Fitzhugh – This is one of those rare instances where I loved the movie just as much as the book. Harriet made me want to be a journalist (and a spy!). I still have my old paperback copy of this one. Hitty: Her First Hundred Years – Rachel Field – Ok, I’ll be honest. I’m not 100% sure that this is the book I’m thinking of. I remember a book about a doll who could think (and talk when people weren’t around) and who got into various situations–the only one of which I remember being left in the backseat of a taxi. I thought the cover was yellow, but maybe not. I read it back when I was in 2nd grade. If anyone has any alternative ideas as to what this book could be, let me know. I’m going to try and score a copy of Hitty to see if it’s what I’m thinking of. Matilda – Roald Dahl – Quite possibly my favorite book of all time. Matilda never gets old and she’s totally my role model. Ramona Quimby, Age 8 – Beverly Cleary – I loved the Ramona books as a kid and still do. They’re clever, lovable and just all around a joy to read. Tuck Everlasting – Natalie Babbitt – God, this book was so mysterious to me! I remember having to read it for school (weirdly, I was in Catholic school) and absolutely tearing through it. Another movie I haven’t seen and don’t care to. 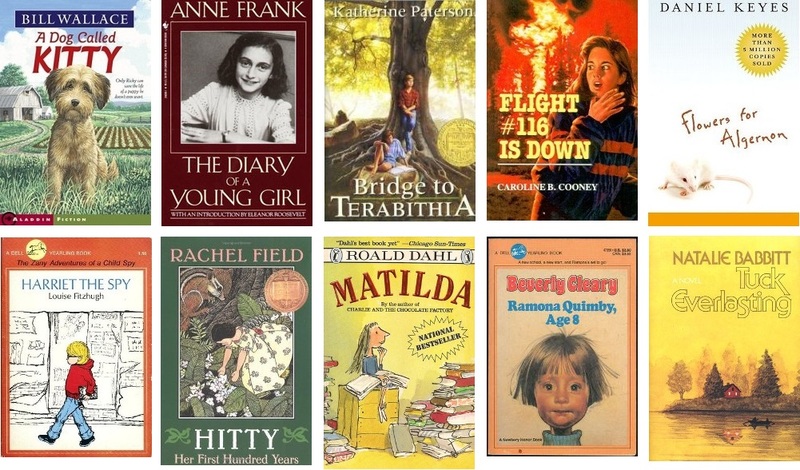 What books do you remember most as a kid? Which ones would you want to reread?? When I was growing up, it was Judy Blume books. I enjoyed all of her books and read them repeatedly. One of her books, Tiger Eyes, is a movie on Netflix. The movie was ok and surprisingly stayed on track with the book. Her books would approach different solutions to real issues, such as being teased about your weight, birth of a new sibling, death of a parent, divorce and so on. Her books entertained me for years. Oh yes, I remember reading Tiger Eyes… and Forever… and loads of others. She’s actually got her first new book in years coming out this summer http://www.theguardian.com/books/2014/dec/16/judy-blume-novel-adults-in-the-unlikely-event Hopefully will get a copy to review!